With Delicas,size 15 seed beads & mini bugles you'll learn to make independant components. 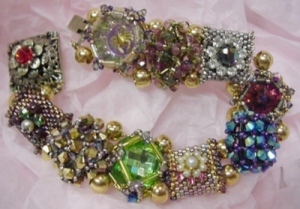 Then using your treasures you've collected from recycled jewelry to embellish each component and re-create the popular and elegant Victorian Slide bracelet. Flat Peyote 1 to 3 strips following the graph at the right. 10 beads accross and 40 rows on the diagonal down. Use the 24 karat gold or sterling Delicas. A pattern is great! Be creative, have fun. Bring these to class flat with any extra thread attached. Supply sheet below.